$120.00 In stock - low quantity. Order in the next 19 hours, 54 minutes and it will go out today! In stock - low quantity. Order in the next 19 hours, 54 minutes and it will go out today! This trick is perfect for kids' magicians as well as clowns! 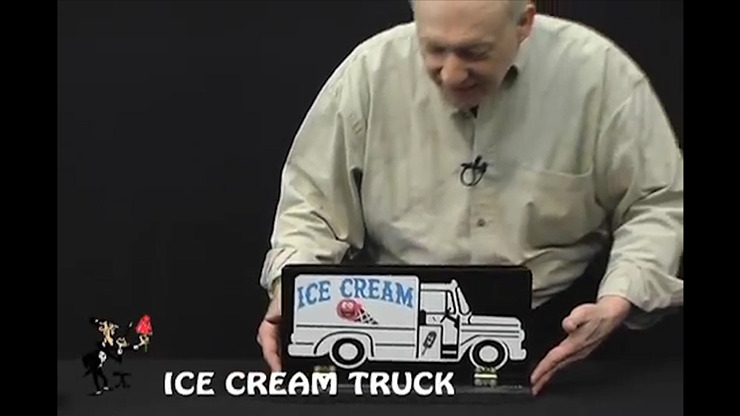 As you tell the story of the neighborhood Ice Cream Man and his daily visits, you show a beautifully hand-crafted wooden prop with an ice cream truck silk-screened on the side. When you open up the truck, you reveal four silk-screened cones topped with ice cream (2" sponge balls), all the same color. As you continue to tell the story of how the Ice Cream Man only had strawberry ice cream, you pluck each piece of "ice cream" from the cones and cause all of them to vanish in your favorite way. With the ice cream cones empty, you close the door to the van, make a magical gesture, and when you open the door again, all the cones are filled with "ice cream" (2" sponge balls) of many different colors! Dimensions 14" X 8" X 4"